The finishing touch for such a perfect night? Why, sparklers AND fireworks of course! Long-time couple Shannon & Axel tied the knot among family and friends in a beautiful white country chapel in the Texas Piney Woods. The reception had guests enjoying traditional Texas BBQ, dancing the night away and capturing memories in the old fashioned photo booth! 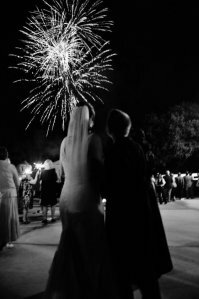 A magical moment…the perfect wedding day finale provided by Blaise Pyrotechnics.